Halloween How-To: 70s Decade Icon | Grand Central Magazine | Your Campus. Your Story. Need a last minute costume idea? The 70s decade icon is cheap, easy, and super trendy. Not only will you be “in costume” when dressing in 1970s-inspired clothes, but you’ll also be in style! The 70s fashion trend is in right now. Obviously you can’t talk about clothes from the 70s and mean just one style, but the focus of this look is hippie and flower-child enthused. The hippie subculture was originally a youth movement that came about in the United States in the late 1960s. 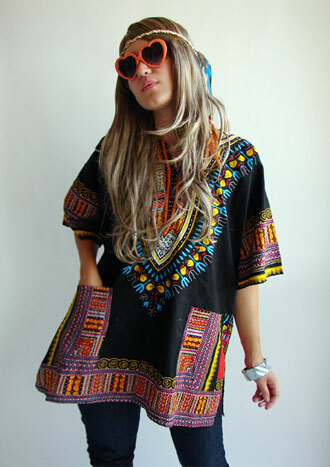 Hippie fashions and values had a major effect on culture and influenced popular music, TV, literature and arts. Wear your hair down in a wavy/messy style. If you have any of the feather hair pieces that were so popular this summer, you can add those to your hair to enhance the 70s look. Sunglasses are a must! Aviators, small, round-framed glasses that are John Lennon-inspired and heart shaped lenses would be your best choices. Ethnic and Boho jewelry would top off the look. Think lots of beads, peace signs, bright colors and flowers. Wear a lot of bracelets. They could be a random combination of braided, hemp, leather and metal. If you’re unsure about what Boho jewelry is, peace sign necklaces can be purchased at Walmart. Think browns, bright colors, fringe and floral patterns. For this part of your outfit Goodwill and Salvation Army are two inexpensive places to look. Option A: The classic tie-dye shirt. Option B: A Fringe crop top. belly button. Next cut half-inch wide slits from the bottom of the shirt vertically to your belly button. This creates a cropped, fringe look for your shirt that shows a little stomach. Choices include a long flowing skirt, wide leg flare jeans or a jean skirt. Wear your favorite strappy sandals or if you’re feeling very inspired by this look go barefoot! Separator image Posted in Campus Fashion, Style, Style and tagged with Central Michigan University, Fashion, Grand Central Magazine, Jordan Reed.